First appeared in 1956, also the Day-Date has seen in years (since 2008) to grow his chest up to 41 mm in diameter. 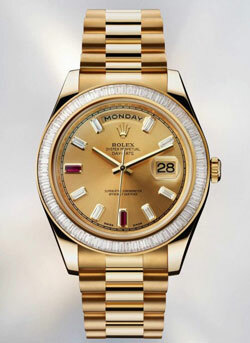 Without exceeding the canons of classic luxury Rolex watches to be represented in gold with President bracelet, the specimen shown here is considered uncommon. The new version of champagne dial with sunray finish features 8 hour markers marked with baguette-cut diamonds, two rubies, all included in ouches of gold. As in all Day-Date the twelfth missing since replaced the traditional hard the day of the week. On the other eighty bezel stones were laid, more and baguette. However, the brilliance of these Rolex is mainly due to the particular President bracelet, as the Oyster, always has three rows of links with the central glossy finish, but closer together and characterized by a different curvature. In place of the closure clip OYSTERCLASP there is the one with invisible CROWNCLASP. Like all other Oyste r steel is water resistant to 100 meters although, beyond the service usually is always difficult to convince a true fan to dive with a timepiece – a lot less “rich” in this. In keeping with every new Rolex philosophy always takes the opportunity to always fit the latest mechanical movement: the Day-Date II is equipped with the Calibre 2012 3156 COSC-certified spiral PARACHROM, anti-shock PARAFLEX.